Yes that’s right, for a very limited period, we’re giving you the opportunity to save 20% off the My Champi Brown Mushroom Kit by simply entering ECODE44 at checkout! With the patented system of MyChampi, anyone at home can easily grow mushrooms. Grow the best tasting mushrooms for you and your family in 3 weeks, live and learn what a mushroom is and how it grows. Growing mushrooms is fun and an educational experience, for kids as well as adults. That’s why a booklet is enclosed with an explanation on mushrooms (and fungi in general) and how they grow the booklet also contains some delicious and simple recipes for you to try, so that everyone will enjoy their own home-grown mushrooms. Every thing you need to grow your mushrooms is in the box! The Cruiser-type of (Polypropylene) barrow is preferred by most professional users, but there are a few jobs that require steel barrows, e.g. working with hot tar or near sources of extreme heat. There also remains a small minority of users who still believe that steel is stronger than Polypropylene. For such customers and such applications, the County Carrier fits the bill perfectly. Its 90 ltr tray is constructed in heavy-gauge steel, has double-rolled edges for both strength and safety, and sits on top of a well-balanced one-piece frame. The large 4-ply, block pattern tyre with a built-in pneumatic tube completes the picture. For the conservative buyer, there is no better barrow. The Carrier – an all-steel, dependable Workhorse. Priced at only £75.00, these won’t be in stock for long! Thrive is about to launch its Plant a Difference campaign for 2011. They are asking people to hold swapping events to raise money so we can send a box of herbs or perennials directly to somebody who asks for our help. For every swap, make a donation to Thrive and for every £35 raised they’ll send out a fantastic box of plants. Swapping events can be plants, books, produce, clothes – anything! They can help make your swap a success with their fund raising pack. 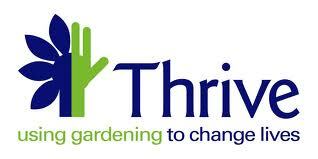 Or why not go to to Thrive’s swap, the first one is being held on Saturday April 30 at their open gardens event at Trunkwell, Beech Hill, Reading, between 10am and 4pm. Can you help? We hope so!